Hello, My dear fashion addicted ladies, I am here to show you fringe boots and best ways how to make them look awesome on you during street walks on the town. Most you think of wild west and cowboys when somebody starts to speak about fringes. This is only prejudices! Fringe boots is a whole different story this year! If you haven’t tried fringes before, then this is might be one of the easiest ways to make this trend work for you. Sure, fringes are not something new in the fashion world, look at 1970’s images, where almost every girl and woman appeared in this beautiful embellishment. We live in a period when almost everything is in trend and only your personal taste can make yourself look gorgeous. 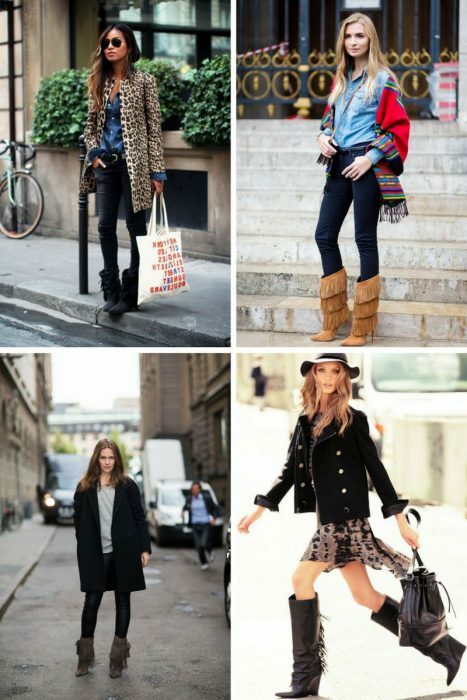 Fringe boots are considered to be extremely versatile and I do think you should give it a try. So, you finally decided to buy yourself a good pair of fringe boots. Let’s get down to business and find out how to wear them in real life. From my personal experience, I would recommend suede fringe boots, but you can experiment with other materials. Wearing fringe boots is all about balance. You should add a unique vibe that can easily improve the whole outfit. Forget about sleek and simple boots, it’s time to go for a stiletto or block heel boots. How to make them visible? The rest of your outfit has to be sleek or fitted, forget about oversized pants, maxi skirts or bulky jackets. You want everyone to see what’s on your feet, right? So, make sure fringe boots stand out loud and clear. Now, those of you who do want to show off their pretty fringe boots, I would recommend to pair them with shorts, mini skirts, short or knee-length dresses, and skinny pants, like jeans, leggings or beloved leather skinnies. Speaking of fringe boots design, then it can be whatever style you decide. I personally have one pair of camel ankle boots with block heel and black fringe boots with a stiletto heel. So, what are you waiting for, get inspired by these street style images and choose your favorite to copy next week!